This is ingenious. A compact, machined-metal, ball head, tripod that you can leave mounted on your camera, yet, it doesn't get in the way. 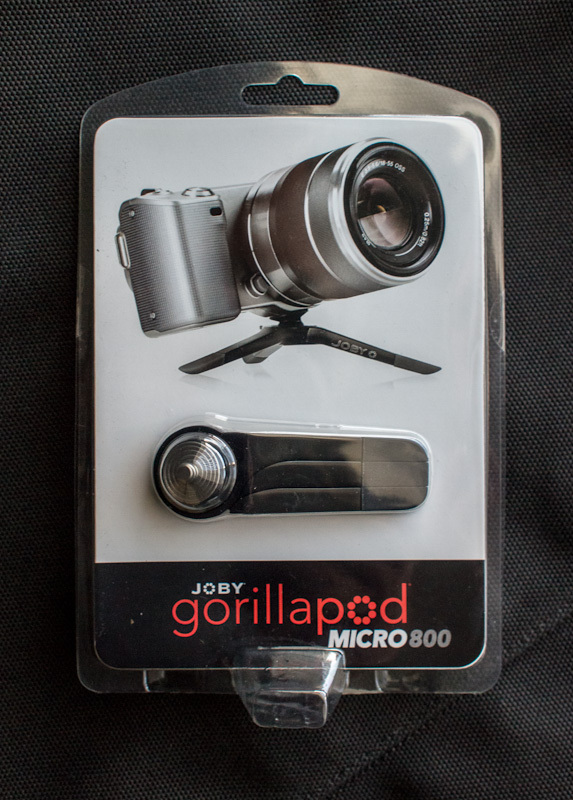 That's the JOBY GorillaPod Micro 800 that I've been testing. This particular size is great for Sony NEX, as well as Panasonic and Olympus micro four thirds, and other cameras that size. For the Olympus Mini and Panasonic GX 1, however, I would go a size down to the Micro 250. When not in use, the metal legs fit beneath the camera. When you need to steady a shot, just spread them out and precisely position the camera using the "just the right amount of tension" ball head. After you get the photo, fold the legs together and be on your way. The 800 runs around $24 and the 250 is about 12 bucks. Nimbleosity rating is 4.5 out of 5. Very cool! I leave one of these on my Canon s90 100% of the time and it's incredibly handy. Especially for a camera like that that isn't the best in low-light. Thanks for the shout out Derrick! Glad you're happy with the Micro 800!